Frank James Lampard, Jr., (born 20 June 1978) is an English football player currently at Chelsea and previously with West Ham United and Swansea City. He is a central midfielder known for his powerful long-range shots and prolific goalscoring abilities from midfield. Lampard was born in Romford, Havering, England. He is the son of Frank Lampard Sr., the former England full back and two-time FA Cup winner with West Ham United. His family is related to another famous footballing family, the Redknapps. Lampard was educated at Brentwood School, a boys' independent school in Brentwood, Essex. A current England national team regular, Lampard is acknowledged as one of the most improved players in English football over the past three years. He has won the English Premiership twice (with Chelsea, 2004-05 and 2005-06), the F.A. Cup (with Chelsea, 2007) twice the League Cup (with Chelsea, 2005 and 2007), the FA Community Shield (with Chelsea, 2005), and the UEFA Intertoto Cup (with West Ham, 1999). Lampard joined West Ham United, where his father was Assistant Manager, as an apprentice in July 1994 as part of their Youth System, and signed his professional forms on July 1, 1995. In October 1995, he was loaned to Division Two team Swansea City. He made his league debut in the colours of Swansea City on 7 October, 1995 in a match against Bradford City that Swansea won 2-0. He made a total nine league appearances for Swansea, and another two in Cup competitions, scoring one goal, his first in senior football against Brighton & Hove Albion, before returning to West Ham United in January, 1996. Lampard's debut for West Ham came on 31 January 1996 against Coventry City F.C., but he did not become a team regular that season. He then broke his right leg in a game against Aston Villa on 15 March 1997, ending his season prematurely. Lampard's first goal for West Ham came in the 1997-98 season, in an away win against Barnsley. Lampard was a regular in the West Ham youth team and captained his side to the final of the FA Youth Cup in 1996. The 1998-99 season was a prolific one for the young Lampard. He became a regular in the West Ham first team, not missing a single game throughout the season as the club finished fifth in the Premiership standings. Lampard had formed the core of a talented young West Ham team along with players like Joe Cole, Michael Carrick and Rio Ferdinand. But after Ferdinand, a close friend of Lampard's, was sold to Leeds United in the 2000-01 season, and his father, and uncle Harry Redknapp left West Ham, Frank decided to leave as well. Despite reported interest from Aston Villa and Leeds United, Lampard chose to remain in London by joining Chelsea for a fee in the region of £11m. Lampard signed for Chelsea on May 15, 2001 for £11 million, one of the first signings of then Chelsea manager Claudio Ranieri. Lampard's improvement at Stamford Bridge has been slow but spectacular. Despite being an ever present in the first eleven, his first two seasons at Chelsea were sometimes bogged down by his massive transfer fee and later eclipsed by the scintillating form of Gianfranco Zola. In his third season there, however, coinciding with the arrival of Roman Abramovich, he fully blossomed, establishing himself as one of the top midfielders in Europe. Lampard made his debut for Chelsea in a pre-season game against Leyton Orient on July 26, 2001, and scored his first goal for the club in another pre-season match, against Northampton Town, a 7-1 away victory, on August 1, 2001. His Premiership debut for Chelsea came on August 19, 2001, in a 1-1 draw with Newcastle United. Despite being sent off in only his fourth Premiership game for Chelsea, against Tottenham Hotspur on September 16, 2001, the only dismissal of his career, he had a fruitful first season, missing only one match and scoring seven goals in all competitions. In the 2002-03 season for Chelsea, Lampard was at his regular best again, not missing a match throughout the campaign. He scored eight goals in all competitions as Chelsea finished fourth in the Premiership, giving Lampard the chance to play in the UEFA Champions League for the first time in his career. The 2004-05 season was the most successful in Chelsea's history, and Lampard was at its centre. He played in all 38 of the club's Premiership matches, scoring 13 goals (out of his 19 all season), remarkable for a midfielder, helping Chelsea to win their first title in 50 years by a 12-point margin. He scored another four goals in the Champions League as Chelsea made the semi-finals for the second successive year. His two goals in six matches were also instrumental in his club's League Cup victory. So impressive was his form during the Champions League and league run that former Brazilian captain Carlos Alberto and Dutch footballer Johann Cruyff both referred to him as one of Europe's best midfielders, and he ended the 2004-05 season by winning the Football Writers' Association Footballer of the Year award. He did one better the following year by scoring 16 goals in the 2005-06 Premiership season, 2 goals in five Champions League matches, and 2 more in domestic cup action for a total of 20 goals. His form continued to impress, and in October 2005, after a Premiership match against Blackburn at Stamford Bridge, manager José Mourinho declared him the "best player in the world", a sentiment echoed days earlier by Matthias Sammer in a Kicker interview. In September 2005 Lampard was selected as a member of the FIFPro World XI. The team was chosen by a vote of professional footballers in 40 countries. In Winter 2005 he was voted runner-up twice to Ronaldinho, firstly in the European Footballer of the Year award, and secondly in the FIFA World Player of the Year Award. 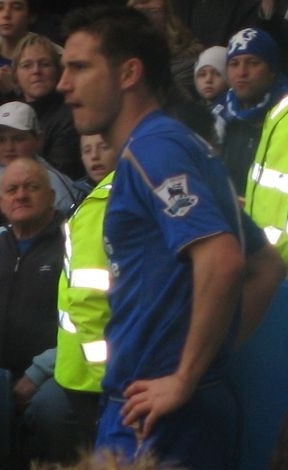 Due to a back injury by captain John Terry, Lampard spent much of the 2006-07 campaign as captain of Chelsea. He was voted fans' player of the month for January 2007 by givemefootball readers after scoring seven goals in eight games. He is currently ranked 4th in the Actim Stats for Best Player of the 2006-07 season, with team mate Didier Drogba holding the No. 2 spot just behind Manchester United's Cristiano Ronaldo. For the second consecutive season he scored 20 goals in all competitions, including an equaliser against FC Barcelona at the Camp Nou where he chipped Víctor Valdés from an acute angle, and two strikes in a 3-3 FA Cup quarter-final draw with Tottenham Hotspur, a game in which Chelsea had trailed 3-1. The latter feat saw him voted the FA Cup's player of the round. He also scored his first hat-trick for Chelsea in their FA Cup third round tie against Macclesfield Town on January 6, 2007. In a post-match interview after winning the FA Cup Final with Chelsea, Lampard clarified his future at the club stating that he would want to stay at the club "forever". Since then, the player has been linked with a possible move to Juventus by the British press, this has intensified since Claudio Ranieri, the man who signed Lampard from West Ham United in the first place took over at the Old Lady. Lampard has scored 90 goals for Chelsea (as of 13 May 2007), making him the top goalscorer currently at the club, and 10th highest in total. He is also the highest-scoring midfielder in Chelsea's history, having passed Dennis Wise's record of 76 goals on 17 December 2006. Lampard is regularly accused by rival fans and as The Guardian puts it, "Frankophobes", of scoring goals from deflections. However, a report from The Guardian newspaper shows that only six of his goals (6,7%) for Chelsea have been scored in that way. Early in his career, Lampard was spotted by Peter Taylor, the England Under-21 manager, and selected for the team. His U21 debut came on November 13, 1997, in Crete against Greece. He captained the England U21 side in the 2000 U21 European Championship. His final appearance for the U21 team was in June 2000 in an away match against Slovakia. Lampard scored nine times for the under-21s, which was bettered only by Alan Shearer and Francis Jeffers (both with 13). Lampard made his first appearance for the senior England team on October 10, 1999, starting in a friendly against Belgium in Sunderland. He played 76 minutes in the 2-1 victory, being replaced by Chelsea teammate Dennis Wise. He was not selected as one of the 23-man squad for the England side for Euro 2000, nor for the World Cup finals in June 2002 in Japan and South Korea. Lampard scored his first goal for the national side on August 20, 2003 in a friendly against Croatia, which England won 3-1. Combined with his improving club form, this helped him earn a place in the England team for the match against Iceland in the FA's Summer Tournament before Euro 2004, and he scored his second international goal as England won 6-1. He was selected in the squad for Euro 2004 in Portugal. England reached the quarter-finals with Lampard having an exceptional tournament. He scored three goals in four matches and was named in the official Euro 2004 All-Star squad by the UEFA technical study group. With Paul Scholes's retirement from international football, Lampard finally became a fixture in Sven-Göran Eriksson's squad, scoring five goals during England's successful World Cup qualifying campaign, and wearing the number 8 shirt that Scholes vacated. At the 2006 FIFA World Cup, Lampard failed to repeat his club form, which became a much discussed topic in the English media. He had 24 shots on goal in the tournament, only 10 of which were on target, and none of which went in. England manager Eriksson defended the player, saying "He is working very hard to be right. He's had more shots than any other player in the tournament, which is very good. I have no concerns about him whatsoever." Lampard played every minute of England’s five games. He was one of three England players (the others being Steven Gerrard and Jamie Carragher of Liverpool FC) who had their penalties saved by Portugal goalkeeper Ricardo Pereira in the shoot-out defeat to Portugal in the quarter-final on 1 July 2006. Totally Frank coverLampard belongs to an illustrious football family. Apart from his father, his uncle Harry Redknapp is also a former West Ham United player. He currently manages Premiership side Portsmouth F.C.. His mother's name is Pat. Lampard's cousin, Jamie Redknapp, has played 17 games for the England football team, and has also played club football for Southampton FC, Tottenham Hotspur, Liverpool F.C. and AFC Bournemouth. Lampard is currently engaged to Elen Rives, who gave birth to the couple's first child, a girl named Luna Coco Patricia Lampard, on 22 August 2005. Elen gave birth to the couple's second child, a girl, named Isla, on 20 May 2007 at 1:52 pm. Isla weighed in at 6 lbs, 8 oz, and was delivered by c-section. He recently revealed that he and Elen plan on getting married this year. He is learning Spanish, which has been the partial cause of speculation linking him with a move to the La Liga, until he revealed it was strictly for family reasons, as his partner is Spanish and he wants their daughter to grow up bilingual. Lampard featured in a "Super Goals" advertising campaign for The Sun newspaper in England during Sep/Oct 2005. 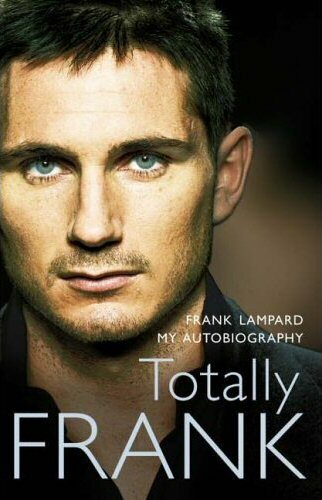 In July 2006, The Sun newspaper serialized his autobiography book Totally Frank, uncovering the secrets of his personal life and his reactions of the disappointing World Cup. He is the only current member of the England team to have gone to a private school, having attended the independent, £11,565 a year, Brentwood School in Essex, at which time he was in the same year as model Jodie Marsh and gained an A in his Latin GCSE. 10. 12 October, 2005 Old Trafford, Manchester Poland 2-1 Won World Cup 06 Qual. 9. 8 October, 2005 Old Trafford, Manchester Austria 1-0 Won World Cup 06 Qual. 8. 26 March, 2005 Old Trafford, Manchester Northern Ireland 4-0 Won World Cup 06 Qual. 7. 9 October, 2004 Old Trafford, Manchester Wales 2-0 Won World Cup 06 Qual. 6. 4 September, 2004 Ernst Happel Stadion, Wien Austria 2-2 Tied World Cup 06 Qual. Full name Frank James Lampard, Jr.